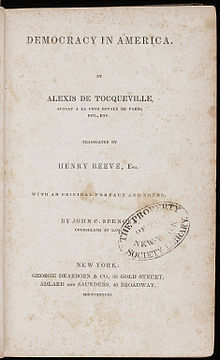 In 1831 Alexis de Tocqueville, a young French aristocrat and ambitious civil servant, made a nine-month journey throughout America. The result was Democracy in America, a monumental study of the life and institutions of the evolving nation. Tocqueville looked to the flourishing democratic system in America as a possible model for post-revolutionary France, believing that the egalitarian ideals it enshrined reflected the spirit of the age and even divine will. His insightful work has become one of the most influential political texts ever written on America and an indispensable authority on democracy. Eric Wilson’s Review: Tocqueville begins his book by describing the change in social conditions taking place. He observed that over the previous seven hundred years the social and economic conditions of men had become more equal. The aristocracy, Tocqueville believed, was gradually disappearing as the modern world experienced the beneficial effects of equality. WHAT HAPPENED? This is a great book and he had and has an acute understanding of what makes America deferent than all other previous forms and nations. While Tocqueville speaks highly of the America's Constitution, he believes that the morels or "habits of mind" of the American people play a more prominent role in the protection of freedom. He gave critical thought to the lowest common denominator family, councils, and townships as the backbone of this nation. He got it; do you? Recommended even if you think you have the answers; if you haven’t read this one, DO.